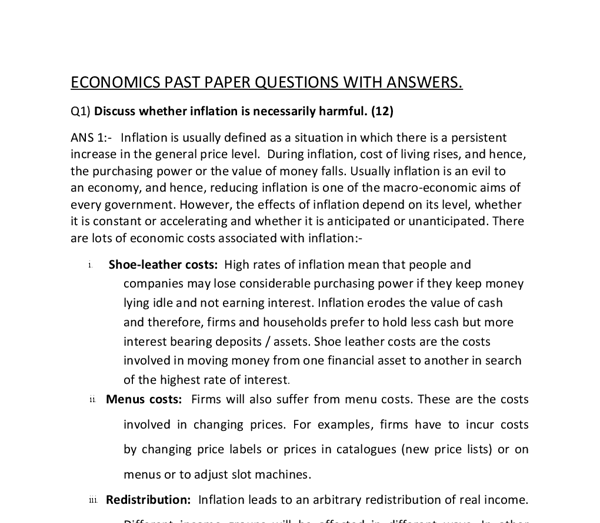 ﻿ECONOMICS PAST PAPER QUESTIONS WITH ANSWERS. Q1) Discuss whether inflation is necessarily harmful. (12) ANS 1:- Inflation is usually defined as a situation in which there is a persistent increase in the general price level. During inflation, cost of living rises, and hence, the purchasing power or the value of money falls. Usually inflation is an evil to an economy, and hence, reducing inflation is one of the macro-economic aims of every government. However, the effects of inflation depend on its level, whether it is constant or accelerating and whether it is anticipated or unanticipated. There are lots of economic costs associated with inflation:- 1. 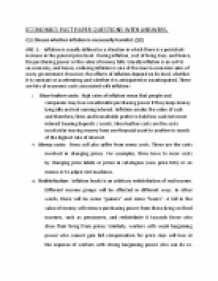 Shoe-leather costs: High rates of inflation mean that people and companies may lose considerable purchasing power if they keep money lying idle and not earning interest. Inflation erodes the value of cash and therefore, firms and households prefer to hold less cash but more interest bearing deposits / assets. Shoe leather costs are the costs involved in moving money from one financial asset to another in search of the highest rate of interest. 2. Menus costs: Firms will also suffer from menu costs. ...read more. Those unable to pay a higher prices will be eliminated from the market. Price rations scarce goods to those who can afford to pay the price. Hence, for price to act as a rationing mechanism, the effect of a rising price must be to reduce the quantity demanded by some individuals. Secondly, prices act as signals and guides to firms about what should be produced in the future. Producers aim at profit maximisation. If consumers wish to consume more of a particular commodity then its price will tend to rise. This indicates to firms that more should be produced; at the same time it provides and incentive for more factors of production to move into that line of production. Firms making the good will be earning high profits. They will wish to expand output. To obtain more of the new materials, machinery and workers wanted they will be prepared to offer higher prices and thus more resources will be drawn to this line of production to meet the increase in demand. In the process we see the operation of what to Adam Smith was like and ?invisible hand? by which individuals, following their own self interest , led to pursue the interests of the community. ...read more. This is a statistical measure that expresses the average price of some group of commodities in some year as a percentage of the average price of the same commodities in some other year. Problems in measuring inflation accurately can arise from the following reasons 1. The choice of the base year: The selection of the base year is a very complicated task. The prices in the chosen base year should be reasonably steady. Periods of severe inflation, deflation or recession should be avoided. 2. The price index is not able to take into account changes in quality: A commodity may not have changed in price but its quality may have fallen. Conversely, a good may be more expensive because it is of a better quality than before. Such changes in quality affect the consumer?s standard of living but cannot be reflected in the price index. 3. Finding a representative group of commodities: In selecting commodities to include in the basket of goods, accurate information on expenditure patterns of households is needed. But there are great difficulties in collecting such data. People are unwilling to disclose their expenditure truthfully. Besides, different income groups do not share the same basket of goods. Even people with the same income do not buy the same commodities in the basket. Thus, the construction of consumer price index involves a lot of guesswork. ...read more. The items need to be easy to find by the price collectors so that price change estimates are based on an adequate number of price quotes collected throughout the UK. These items also need to be available for purchase throughout the year as the CPI is based on the cost of a fixed basket of goods and services. Furthermore, statistical data can be a problem if numbers have been tweaked. To combat reliability of sources, I will employ the method of using credibility criteria. Activity Milestone Review Dates Learner Comments Project Proposal Form Draft 21/11/08 Develop ideas for the title and consider other possible topics, eventually reach a decision. Against an annual average rate of 1.4 percent in 1990s, per capita income grew at an average rate of 13.9 percent per annum during the last two years (2002-04) and 12 percent during 2003-04. The per capita income in dollar terms increased from $526 in 1999-2000 to $652. there is an inverse relationship between inflation and unemployment]. This meant that it was impossible to have low levels of unemployment and low levels in changes in money wages at the same time. The trend he identified became known as the "Phillips" Curve. (Syed Zahar, Are We Importing Crime?, 29 July 2010) 8.1.3 Disadvantages on Social of South Africa The negative of foreign immigrants either legal or illegal in South Africa is they pushed the rate of crime upwards. "A South African may take your cellphone, but he won't kill you. One can prove these 3 scenarios with statistics, if you look at the tables on the following pages you will see the house prices in different regions of the United Kingdom and then you can compare them with the unemployment rates in these regions of the United Kingdom. To keep inflation low but not necessarily zero as inflation is a signal of economic growth. High inflation can be dangerous as it could cause hyper inflation, which leads to the complete failure of an economy as a whole. In less extreme cases it causes firms minor costs like reprinting catalogues as the price increases so much constantly.